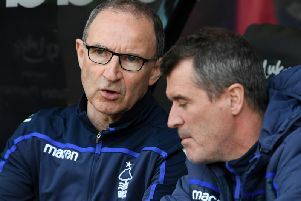 Martin O’Neill praised the performance if his Nottingham Forest side after their 3-1 victory over Wigan Athletic. Goals from Joe Lolley, Matty Cash and Adlene Guedioura gave O’Neill his first win as Forest boss. ”It was terrific to win the game. I thought we did excellently, scored three great goals and there were some excellent performances out there this afternoon,” he said. “I felt we deserved to win the match when you look at the 90 minutes as a whole. “I’ve got to know the players much more over this week and I think that is very important. We’ve been working hard on the training ground and I thought we executed some things really and other things need a little more work. “The response the players gave this afternoon was terrific. I felt the game was a little bit messy in the first half, very stop-start, but Joe Lolley gave us the lead with a fantastic strike and despite then conceding a poor goal, we fought back really well.